Home » Health Graphs » What is a Personal Injury? 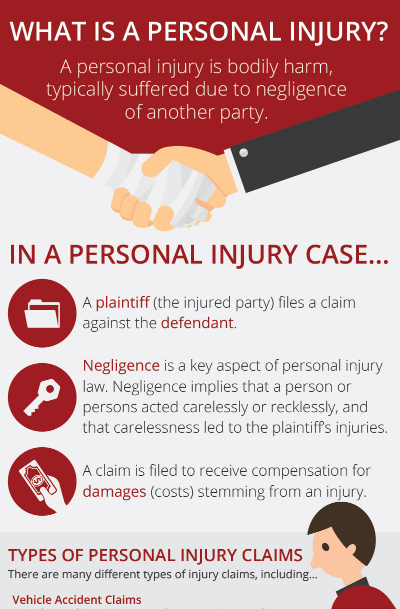 A personal injury is a bodily harm, typically suffered due to the negligence of another party. There are many different types of injury claims, including Vehicle Accident Claims, Workplace Injury Claims, Product Liability Claims, Wrongful Death Claims and more. Why People File Personal Injury Claims? A person files a claim because they’ve suffered an injury that is typically expensive and painful. The claim allows them the opportunity to hold the responsible party accountable for the damages they’ve experienced. The compensation from a claim can help cover medical bills, lost income, diminished quality of life and intense pain and suffering. Contact an Experienced Personal Injury Lawyer.